Islamic State militants accompanied by women and children surrendered to the Syrian Democratic Forces (SDF) in their hundreds on Thursday as the militants lost ground to a US-backed assault on their last shred of territory, the SDF said. 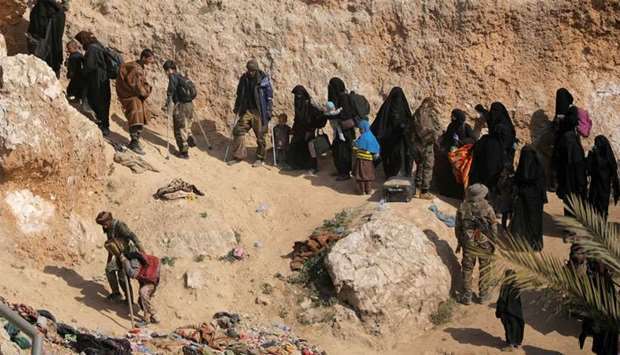 Many of the men could be seen limping as they crossed out of the enclave at Baghouz along a dirt path over a rocky hill, accompanied by weeping children and fully veiled women, dragging suitcases and backpacks behind them. Some of the men were wounded or on crutches. Many were believed to be foreign, SDF fighters said. Children were hoisted onto shoulders to get them up the hill, and strollers left behind. 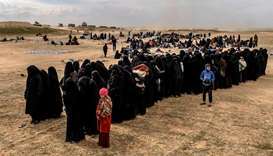 SDF commander Adnan Afrin said the number of evacuees had yet to be determined as people were still emerging but it was in the hundreds, adding to the many thousands who have streamed out of Baghouz in recent weeks. The surrender took place during a pause in the US-backed offensive that began on Sunday to seize the final patch of populated Islamic State territory - which once spanned a third of Iraq and Syria, including the cities of Mosul and Raqqa. 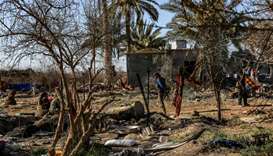 Earlier, artillery fire had pounded the enclave as warplanes flew overhead. The SDF said the jihadists had deployed more than 20 suicide bombers in three counter-attacks in the last two days. 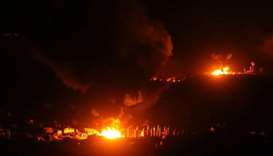 It said at least 112 militants had been killed since it resumed the assault, including more than 15 on Thursday morning. No Islamic State leaders are believed to be in Baghouz, according to a US defence official. US government experts strongly believe group leader Abu Bakr al-Baghdadi is alive and possibly hiding in Iraq. The group is still assessed to be a potent security threat with a foothold in remote areas, and is widely expected to escalate a campaign of guerrilla attacks. Islamic State redrew the map of the Middle East in 2014 when it declared its ultra-radical Sunni Islamist ‘caliphate’ and established a regime known for mass killings, sexual enslavement and meting out punishments such as crucifixion. The group suffered its major military defeats in 2017, when it lost Mosul in Iraq and Raqqa in Syria. The jihadists were then forced down the Euphrates River to their last bastion at Baghouz, a collection of hamlets on the eastern bank. Part of the Islamic State encampment seized by the SDF a few days ago was a scattering of rubble, twisted metal and fallen palm trees. The ground was littered with dirty, ripped blankets, carpets, mattresses and abandoned motorcycles. 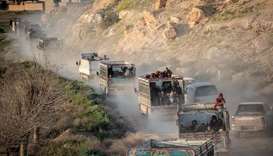 The assault had been postponed repeatedly over the last weeks to allow for the evacuation of thousands of people from the enclave, many of them relatives of fighters. 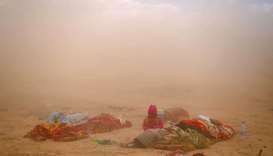 In total, tens of thousands have fled Islamic State's diminishing territory in recent months. They have mostly been taken to a camp at al-Hol, in northeastern Syria. The United Nations says the camp now holds around 67,000 people, 90 percent of them women and children - well beyond its capacity. Camp workers say they do not have enough tents, food or medicine and aid workers have warned of diseases spreading. As of March 9, more than 113 people had been reported to have died en route to the camp or shortly after arriving, the UN Office for the Coordination of Humanitarian Affairs said.